Something weird has happened to my keyboard shortcuts since I upgraded to OSX Mavericks. Command-Option-V, which I was using before my upgrade to cut and paste (i.e. move) files in Finder, now blacks out the display and locks my screen, as well as performing its original function. Command-Option-Eject, which before the upgrade was a very handy shortcut to lock the screen, now does nothing. Can anybody tell me if these are known issues in Mavericks, and if there's anything I can do to get back to normal? Other users have noticed then when using the wired full Mac keyboard, the eject button ejects a disk, but weirdly the eject symbol only appears on the screen and the disk pops out only after about a long delay, about a minute. I've tried unplugging the keyboard and plugging it in a different port. I've restarted, closed down every running application I could find, reset keyboard shortcuts to defaults in System Preferences - still get no response from either Control-Shift-Eject or Command-Shift-Eject (which is supposed to put the machine to sleep). I'm able to lock my screen by setting a hot corner only. Ahhh this is embarrassing. Seems like this is a hardware problem. 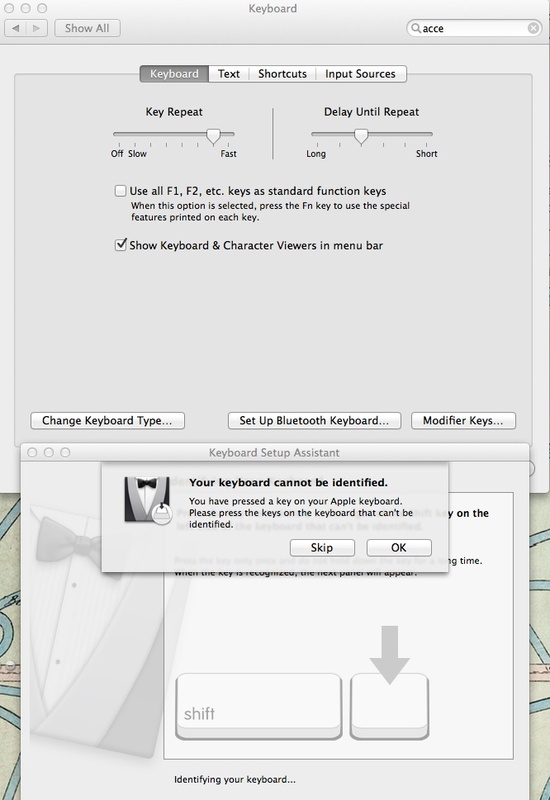 I tried following the steps Apple support suggested, and when I do the keyboard input identification in System Preferences OSX tells me my keyboard isn't recognised. I've just remembered I scrubbed the keyboard with a cleaner cloth a few weeks ago to try and get rid of the yellow grease it had accumulated - I guess this must've messed it up. Sorry Mavericks! Thanks a lot for your help Asmus! Lesson: wear gloves when using white keyboard. macOS Sierra: How do you enable shutdown keyboard shortcut (Ctrl + Opt + Cmd + Power)? How can I re-enable the (display) sleep shortcut on macOS Sierra?